Due to the many variables involved to create a well-behaved, balanced dog, including owner commitment, consistency, and follow-through, it would be unethical for us to offer a 100% guarantee. However, we only choose the most dedicated and diligent owners so, in our experience, no matter how severe the issues, we consistently see breakthrough results and amazing transformations. We have never come across a dog we could not help. We work hand in hand as a team in your dog’s rehabilitation. This process of teamwork and collaboration begins before we even meet your dog, moves through the training process, and continues long after your dog has gone home. Once you hire us, we consider you part of The TopDogK9 family, and your success is our utmost priority. John will determine if owner participation is appropriate or helpful to the program. In most cases, we have found owner participation counterproductive to the rehabilitation and training process. Yes. We specialize in aggression rehab, and we are one of the few places in VA/NC/KY providing successful rehabilitation solutions for problem dogs. We have built our reputation by successfully rehabbing severe cases. I can’t afford your programs, but I really need help with my dog – what can I do? In special cases, we can sometimes arrange a payment plan – please contact us for details. If this is still not feasible, we have free training videos and advice on our Facebook page, YouTube channel and TopDog Tips. Do you use treats to train? Our training approach is relationship-based. We create a love for the behavior in your dog so that the dog is working for us, not for food. This is the only way to get consistent behaviors that will stand up to distractions. Yes, we specialize in state-of-the-art, low-level, communication-style E-Collar training. Our E-Collar program is like nothing you have ever seen, and is nothing like the E-Collar training of old. Contemporary E-Collar Training utilizes the softest, most gentle remote communication, and is one of the most humane and effective approaches to dog training available. My dog is uncontrollable on the walk – can you fix this? Yes. We consistently get fantastic results with all levels of issues, from mild pulling, lunging, barking, growling, to severe dog reactivity. I have tried other trainers before and still have problems – what makes your program different and more effective? We are often the last stop after clients have been through multiple trainers. Unlike other training approaches that only focus on developing rehearsed behaviors, bribing with treats, or merely bandaiding the problem, we have developed an innovative relationship based approach that changes the dog’s state of mind. Once we have that balanced relationship, the sky’s the limit for what we can achieve. By cultivating new habits, teaching the dog to make better choices, and employing our unique duration work, we are consistently successful with dogs that others are unable to help. This will be the last dog training you will ever need. Why Settle For Less, When You Can Have The Best!!! Over 50 years of combined training experience. Our trainers are specialists in pet training and obedience as well as working dog sports, protection and detection. 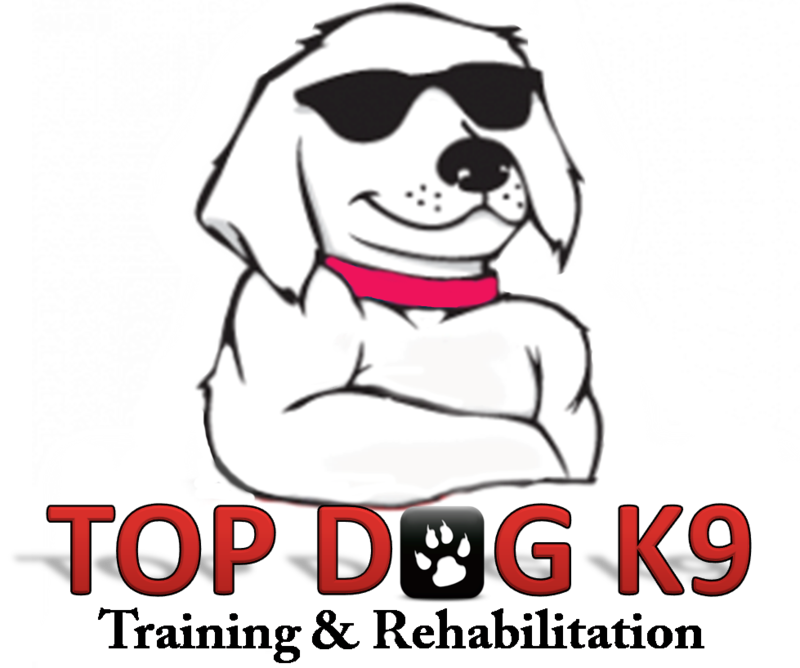 Click the button below to begin your adventure as a member of the exclusive TopDog K9 Team! TopDog K9 knows how difficult finding a great boarding facility for certain breeds can be. Not here! Any breed, any size, any problem, we've got you covered! We come to you! At TopDog K9, we come pick up and drop off your dog.